SEOUL - The US ambassador to South Korea was slashed in the face by an unidentified assailant at a public forum in the capital early on Thursday, police and a witness said. 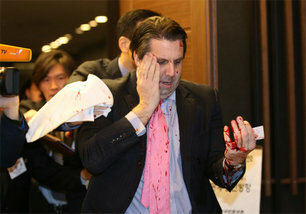 Ambassador Mark Lippert was attending a breakfast forum in central Seoul when a man attacked him, slashing him in the face, a witness at the event told Reuters. Lippert, 42, was bleeding from a facial wound but was walking after the attack as he was taken to the hospital, the witness and news reports said.